In August, communities celebrate their local farmer’s markets during National Farmers Market Week. Farmers markets serve as anchors across American communities, positively influencing community health and wealth. Markets result in more viable regional economies and local farm businesses, increased access to fresh, nutritious food, and stronger social networks that help keep communities healthy. Preserve America’s rural livelihoods and farmland – 50% of farmers selling at farmers markets derive at least half their revenue from farmers market sales. 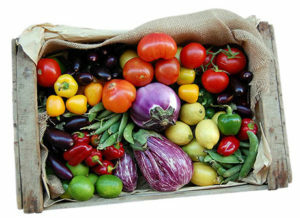 Stimulate local economies – Virginia Cooperative Extension reported that Southern Virginia households spending 15% of their weekly food budget on locally grown food products would generate $90 million in new farm income for the region. Increase access to fresh, nutritious food – The number of farmers markets and farmers accepting SNAP benefits has increased 40% on average every year since 2009. With affordable prices and special programs for low-income people, markets are expanding access to fresh, nutritious food. 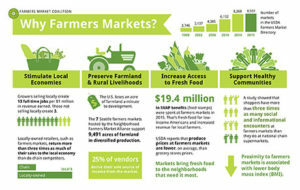 Support healthy communities – Farmers markets provide communities with a healthy food environment. They are places where farmers and neighbors come together to educate each other about nutrition, cooking, and farming. With abundant produce, farmers markets help increase fruit and vegetable consumption. Promote sustainability – Farmers markets create new business opportunities for farmers interested in selling sustainably produced food. 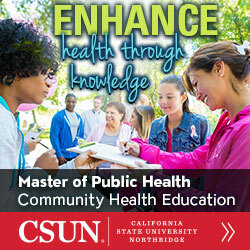 This helps protect the natural environment, public health, human communities, and animal welfare. Beginning in 2016, there were more than 8,500 farmers markets in the U.S — that is 50% more than just five years ago. As these markets become more established, they offer more services and benefits to their communities. The Farmers Market Coalition hopes you will help us celebrate National Farmers Market Week by visiting your local market and spreading the word that markets are growing in impact!